Western blot analysis of extracts from HeLa cells transfected with non-targeted (-) or targeted (+) siRNA. Chk1 was detected using the Chk1 Antibody #2345, and p42 was detected using the p42 MAPK Antibody #9108. 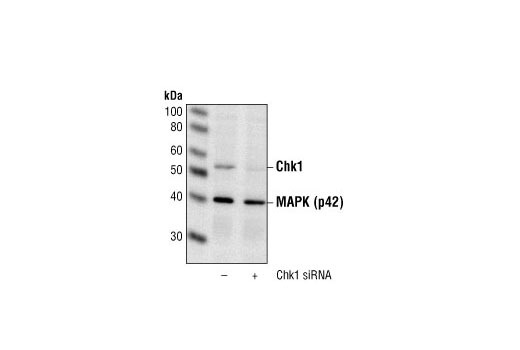 The Chk1 Antibody confirms silencing of Chk1 expression, and the p42 MAPK Antibody was used to control for loading and specificity of Chk1 siRNA. CST recommends transfection with 50 nM Chk1 siRNA 48-72 hours prior to cell lysis. 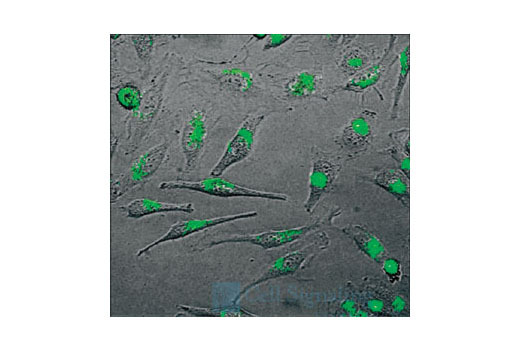 SignalSilence® Chk1 siRNA from Cell Signaling Technology allows the researcher to specifically inhibit Chk1 expression using RNA interference, a method in which gene expression can be selectively silenced through the delivery of double stranded RNA molecules into the cell. All SignalSilence® siRNA products are rigorously tested in-house and have been shown to reduce protein expression in specified cell lines. Chk1 kinase acts downstream of ATM/ATR kinase and plays an important role in DNA damage checkpoint control, embryonic development, and tumor suppression (1). Activation of Chk1 involves phosphorylation at Ser317 and Ser345 by ATM/ATR, followed by autophosphorylation of Ser296. Activation occurs in response to blocked DNA replication and certain forms of genotoxic stress (2). While phosphorylation at Ser345 serves to localize Chk1 to the nucleus following checkpoint activation (3), phosphorylation at Ser317 along with site-specific phosphorylation of PTEN allows for re-entry into the cell cycle following stalled DNA replication (4). Chk1 exerts its checkpoint mechanism on the cell cycle, in part, by regulating the cdc25 family of phosphatases. Chk1 phosphorylation of cdc25A targets it for proteolysis and inhibits its activity through 14-3-3 binding (5). Activated Chk1 can inactivate cdc25C via phosphorylation at Ser216, blocking the activation of cdc2 and transition into mitosis (6). Centrosomal Chk1 has been shown to phosphorylate cdc25B and inhibit its activation of CDK1-cyclin B1, thereby abrogating mitotic spindle formation and chromatin condensation (7). Furthermore, Chk1 plays a role in spindle checkpoint function through regulation of aurora B and BubR1 (8). Research studies have implicated Chk1 as a drug target for cancer therapy as its inhibition leads to cell death in many cancer cell lines (9). Small Interfering RNA (siRNA) has been used to specifically silence chk1 in various human cancer cell lines (5). Liu, Q. et al. (2000) Genes Dev 14, 1448-59. Jiang, K. et al. (2003) J Biol Chem 278, 25207-17. Martin, S.A. and Ouchi, T. (2008) Mol Cancer Ther 7, 2509-16. Chen, M.S. et al. (2003) Mol Cell Biol 23, 7488-97. Zeng, Y. et al. (1998) Nature 395, 507-10. Löffler, H. et al. (2006) Cell Cycle 5, 2543-7. Zachos, G. et al. (2007) Dev Cell 12, 247-60. Garber, K. (2005) J Natl Cancer Inst 97, 1026-8. Chen, Z. et al. (2003) Mol Cancer Ther 2, 543-8.